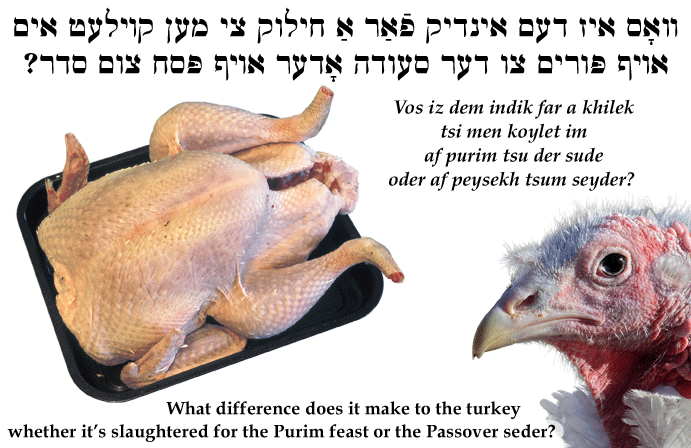 Yiddish Wit: What difference does it make to the turkey whether it's slaughtered for the Purim feast or the Passover seder? וואָס איז דעם אינדיק פֿאַר אַ חילוק צי מען קוילעט אים אויף פּורים צו דער סעודה אָדער אויף פּסח צום סדר? What difference does it make to the turkey whether it's slaughtered for the Purim feast or the Passover seder?